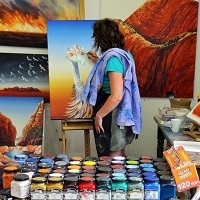 Explore the exciting possibilities watercolour offers artists in this one day studio workshop. Limited to only 4 participants, this workshop explores the exciting medium of watercolour. Learn how to control wet on wet, use glazes and washes, and some of the many methods for preserving the light. Email Linda at lmacaulay64@gmail.com for an enrolment form or call on 0407 539 800. Almost fully booked. Please contact Linda regarding an alternate date.